Inklined: Oil and Water, Do I Mix? Last Thursday, my post was about a Neil Gaiman quote about favorite books. Basically, the quote made me feel like an inadequate reader. So, while were talking about ways I feel inadequate as regards to famous author's quotes, let's look at one by famous author, Youtuber, and Nerdfighter, John Green. As with last week's quote, I like the idea here. It's a romantic sounding quote and as a hopeless romantic myself I, of course, like the idea of it. But here's the thing. I'm an extrovert. And I'm not even just a little extroverted. I have large groups of friends, I love spending time with people, I'm almost completely comfortable giving speeches or preforming in front of people. And yet, I dare to call myself a writer. So this quote by John Green, makes me question my choice in hobby and potential career. You can probably understand why. While I don't always agree with Mr. Green, I do respect him and his writing. 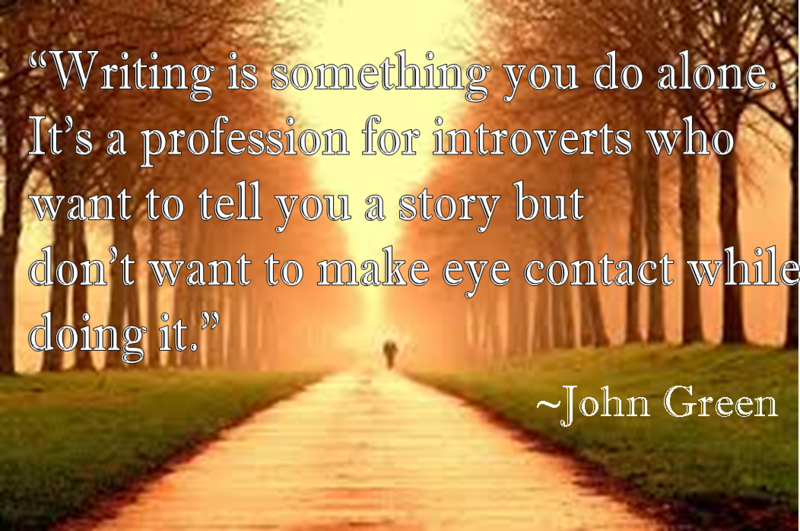 And while I know this quote isn't saying it, what I hear him saying is that good writers have to be introverts. And I have to hope, really hard, that's not true. I write because I love books and characters, words and worlds. I write because there are stories in my head and I'm not funny enough to be a stand up comedian. I write because I'm homeschooled and live in the middle of nowhere and sometimes imaginary people are the only ones I can talk to. I write because once I've told you the written story I want you to feel comfortable telling me yours. I'm an extrovert, but I'm also a writer. What about you? Introvert? Extrovert? Why do you tell stories? Can extroverts be writers, or is it a 'profession of introverts?' Leave a comment and let me know. Of better yet, write a up a blog post and leave the link to it in the comments. I love seeing blog posts inspired by my own posts! Thanks for reading! See you Monday. P.S. A reminder that I'm living in a theater for the next 3 days and probably won't be able to reply to blog comments. Doesn't mean I won't miss you guys! Well, personally I've never decided whether I'm an intro or an extro, I like being alone a lot, and I can be shy, but I do love people. And I don't agree with that quote. I know some extroverts who are very good writers. Although I do think more introvert probably write than extroverts. You can bet your bootlaces that extroverts can be writers. However, we authors have different goals when it comes our writing. We write so we can reach and connect with more people. We're usually the ones who, due to circumstances beyond our control, don't get the social contact we desire (as you mentioned). We write because sometimes the spoken word doesn't make the best first impressions that we desire. We want so badly to be accepted by people that it's easier to write down our words, make them perfect, and let them read them. For me, at least, it means that I don't hold my writing as close to my heart as our introvert brethren. Sure, it means a lot to me and I want it to be perfect, but there's no point in writing if you can't immediately share it with your friends. The funny thing is, while I'm the writer in my family, my introvert mother (while she does do some writing) is more of a story teller. I'm definitely an introvert. Unless I'm on the internet, that is. Why do I write? I write because I love to tell stories, and because I want them to last, but they don't come out right if I just say them. I have to write them down. Can extroverts be writers too? Definitely. I know extroverts who write, and there are plenty of reasons for writing that can certainly apply to extroverted people as well. Or I would think so, anyway. I know! What is it about being on the internet that makes us introverts so open? I talk to complete strangers like they're old friends, when I can barely talk to new friends. I'm an introvert but when it comes to writing, personally, I don't think it matters what you are. It only matters that you can sit down and bring a story alive. Writing is a profession of writers. That's all. I kind of think the whole extrovert/introvert system is idiotic. Plenty of good writers are "extroverts"--the only reason people assume you have to be an introvert is because it requires spending long periods of time away from contact with other humans, which extroverted people tend to have a more difficult time doing. The thing is, though, nobody purely is introverted or extroverted--you'd have to be crazy to be entirely one or the other. So while, when it comes down to it I consider myself an introvert because I love doing "introverted" things like writing and reading and watching movies--and I can easily go a day or two without human contact--I also know that if I go more than those couple days, it absolutely drains me (just like not getting enough time alone does). I have quite a few friends, and love being around people, and feel more at home on stage than practically anywhere else. So, yeah. It's kind of an idiotic system. I feel like it does more to tell people how they're doing things wrong ("You're an extrovert, so you can't enjoy writing!" "You're an introvert, so you can't enjoy parties!") than actually help anyone. I think that maybe he meant that it's easier to be a writer if you're an introvert because you're okay being alone a lot. But I agree that both introverts and extroverts can be great writers. Extroverts get more experience around people, and introverts get more time to write by not hanging out with people. I'm kind of an in-between person. Sometimes I like being alone, but after a while I do get lonely and feel lost without being around people for too long. So yeah, both have their strengths.